Exploring the possibilities of metal detecting is fun but there is only so much that can be done without a professional metal detector. Normal metal detectors are good for finding one or two small objects at a time. Professional metal detectors, on the other hand, are great for finding those large or deeply hidden treasures. When using a professional metal detector, it is best to determine what exactly is going to be dug up. Since valuable finds are being sought after then it is wise to look for what people buried and not what was accidentally dropped. When burying their valuable coins or treasure, people would often encapsulate these contents in a container so deep into the ground so that no one except themselves could find it. In this case, a deep metal detector is necessary to retrieve the stash because it has the capacity to detect these containers. This is where an enterprising archaeologist would do research such as heading to the library or speaking with the locals. This can provide helpful insight as to what and where something of value can be discovered. There is also the chance of gold and other precious metals being so rooted in the ground that the signal from a regular metal detector just can't reach. These valuable metals may not have been placed there but a professional metal detector built for the depth is essential. In that case, a two-box metal detector is necessary to retrieve it from the ground. 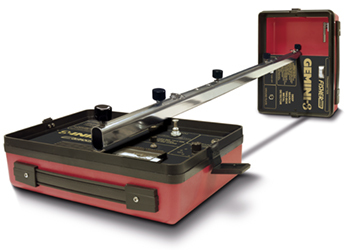 The two-box metal detector can send signals deep into the ground using a special search coil. If the signal finds a target then it will ricochet off the item and return to the metal detector thus pinpointing the item. This special search coil is not found on other metal detectors and can be used to find smaller individual items. The newer deep metal detectors can even identify the type of metal in the ground which makes it easier. When choosing two box and deep metal detectors, there are three different price levels with each having their own advantages and disadvantages. The entry level deep metal detector is fairly easy to use and does its job well. The downside is they cannot identify the type of target nor can they detect as well as some of the more expensive varieties. The mid price professional metal detectors are able to discriminate against ferrous and non-ferrous metals. They can detect voids underground which is great for finding containers or tunnels that can contain valuable metals. In contrast, the more expensive deep metal detectors are able to find and identify precious metals at an extreme depth. Ultimately, the metal detector depth will vary between device so it is a good idea to do some research on each one before purchasing. There are many different possibilities so it makes sense to know what is being dug up before purchasing a professional metal detector. The good news is that there is a professional level device for just about everyone!